Little Trees Hill, 74m, part of the Gog Magog Hills, is on Cretaceous Lower Chalk, having a glacial covering of boulder clay with underlying gravel currently excavated by badgers. The region has been grassland probably since prehistoric times and was famous for extensive sheep walks until well into the 19th century. It provided a well-used thoroughfare linking Cambridge to Norfolk and the South. Neolithic axes were taken from Grimes Graves to Wessex. The Icknield belt of open heath stretched across relatively dry chalkland between the Fens and the Chilterns. Aerial Photographs courtesy of University of Cambridge Unit for Landscape Modelling. 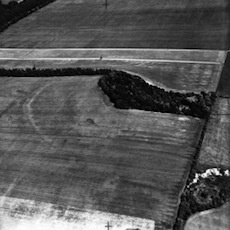 A causewayed enclosure, partially eroded by ploughing but generally in good condition has been identified on Little Trees Hill. The perimeter is defined by a segmented ditch closely following the 60m contour. A trackway, NW to SE, on northeast side partially converges with the enclosure. There are 50-70 enclosures nationally, mainly in Southern and Eastern England with five sites in Cambridgeshire, constructed over a 500 year period in Middle Neolithic, continuing in use in later periods. 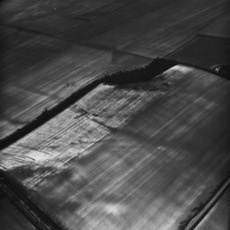 The ditches forming such enclosures tend to be shallow and may have been used for retaining live-stock rather than for defensive purposes. It is thought they might have been points for seasonal meetings, perhaps for the counting and selling of cattle. 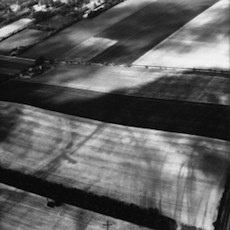 Recent interpretation of the aerial photographs suggests that some of these formations may be the result of soil creep. However, the Little Trees Hill site is on the southern end of the Gog Magog Hills crescent which includes Wandlebury and War Ditches and recent excavations of a ceremonial site from the Neolithic to Iron Age dates. A Bowl Barrow is present on Little Trees Hill, within the enclosure. This feature is thought to indicate Bronze Age reuse of the Neolithic enclosure. The surrounding ditch has become infilled over the years, but can be traced around the eastern and southern sides. It is part of a wider group extending across the chalk uplands of North Hertfordshire and South Cambridgeshire. Bowl barrows are Funerary monuments dating from the Late Neolithic to the Late Bronze Age. Further evidence of Neolithic and Early Bronze Age activity was revealed by surveys which identified a distribution of Flint tools and manufacturing debris in 1979/80 and 1990/91. A Neolithic flint arrowhead was found in 1970. By about 970 the Abbey of Ely holdings included those of previous independent minster estates. Moor or Heath field comprising Wandlebury, Gog Magog and Heath Farms and Little Trees Hill was recorded as 500 acres in the 13th century and 547 acres in 1740. The Lords of Sternes, the other manor in Stapleford, had a demesne sheepwalk and copyhold each for 500 sheep. The area was ploughed to improve pasture c1720 and c1810 by sowing of grass seed despite opposition from the Dean and Chapter, who always claimed sole ownership of the heath and sheepwalks. The land was divided in 1741 between the Dean and Chapter and Lord Godolphin, each receiving 274 acres with sheepwalks for 300 animals. With enclosure in 1814 a lot of chalk grassland was ploughed for arable use, but sheep were still present. The area under grass more than doubled from 176a in 1885 to 417a in 1905 through partial conversion of Heath Farm to a golf course. An extensive plantation was laid out around the hilltops in the mid to late 19th century. From 1894 wheat, barley and until the 1920s, oats, remained the principle crops.